The Inter-Mountain file photo Elkins High School senior linebacker Daniel Romans is a first-team selection on the the Class AA, all-state squad. CLARKSBURG — Elkins High School’s Daniel Romans and Petersburg’s Jacob Hartman have been named to the Class AA, all-state first team, as selected by the West Virginia Sports Writers Association. Romans, a senior linebacker, led the Tigers in tackles for the second straight season. He finished the 2018 campaign with over 100 stops, averaging 10 tackles per contest. Hartman, a senior quarterback-defensive back, helped lead the Vikings to their first playoff appearance in 25 years this past season. He was selected to the first team as a utility player for his all-around efforts. During the regular season, Hartman completed 117 of 205 passes for 1,882 yards with 23 touchdowns, while rushing for an additional 624 yards and 11 scores. He also collected 78 tackles on defense. Quarterback Connor Neal, who led Fairmont Senior to an undefeated 14-0 season and the program’s first state championship in 72 years is the captain of the first team. Neal completed 211 of 282 passes for 3,620 yards, 46 touchdowns and only three interceptions. Neal ends his Fairmont Senior career with 79 career touchdown passes, 6,449 yards and only six interceptions in just two years as the starter. He is joined in the backfield by another pair of Big 10 players, running backs Jake Bowen of Bridgeport and Ghovan Davidson of Robert C. Byrd. Bowen ran for 2,267 yards, a single-season record for the Tribe, and 35 touchdowns. Davidson capped his campaign with 2,104 yards and 26 rushing TDs. Both broke school records for career rushing yards this year. Injuries cut Ethan Payne’s sophomore campaign at Poca short, but the fantastic Dot running back still earned first-team honors with 1,081 yards and 17 touchdowns. Donovan Kirby, meanwhile, rushed Weir into the state semifinals, toting 229 times for 1,668 yards and 26 rushing TDs. Mingo Central’s Drew Hatfield finished the regular season with 1,054 yards and 16 touchdowns to pick up a first-team spot at wide receiver. Oak Hill’s Abe Farrow earned the other receiver spot with 826 receiving yards and 14 touchdowns in the regular season. The offensive line is comprised of Fairmont Senior’s Zach Frazier, RCB’s Robert Arnold, Winfield’s Jacob Huff, Bluefield’s Mason Walker and Nitro’s Will Dean. Bluefield’s Kaulin Parris is the first-team kicker. Utlility spots went to Hartman and Sissonvile signal-caller Will Hackney. Bluefield’s Juice Edwards is the defensive captain at defensive back; Poca’s Bronson Skeens and Fairmont Senior’s Elijah Posey snared the other two secondary slots. The defensive line is Bluefield’s Sean Martin, Bridgeport’s Austin Sponaugle, Shady Spring’s Terymykal Alexander and Weir’s Tyler Komorowski. 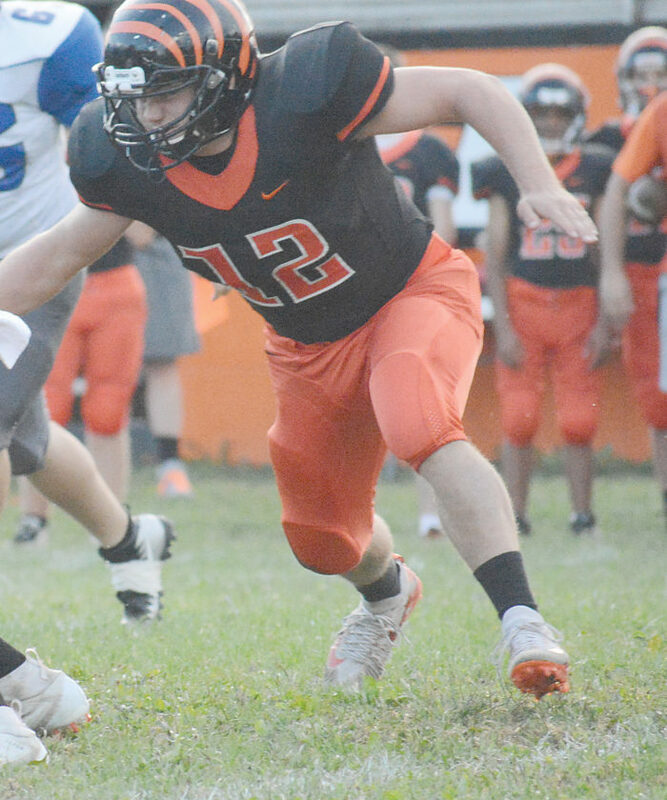 Join Romans as first-team linebackers are Lincoln’s Hunter Moore, Wayne’s Mike Bartram, Bluefield’s Arnold Martin and Nicholas County’s Jared Sagraves. Point Pleasant’s Cason Payne was selected as a utility player and also the first-team punter. Weir’s Sebastian Spencer and Fairmont Senior’s Rhett Heston are also utilities. Second-team captains are PikeView running back Evan Rose and Keyser defensive lineman Don Woodworth. Area players named special honorable mention included Elkins’ Austin Storey, Philip Barbour’s Chase Collier and Petersburg’s Doug Morral and Tyce Wisnewski. Honorable-mention laurels went to Elkins’ Thomas Talkington and Chance Burdette, Philip Barbour’s Damien Gonzales and Petersburg’s Peyton Sindledecker and Dakota Rohrbaugh. WR – Drew Hatfield, Mingo Central, Jr.
WR – Abe Farrow, Oak Hill, Sr.
RB – Jake Bowen, Bridgeport, Sr.
RB – Ghovan Davidson, Robert C. Byrd, Sr.
RB – Donavan Kirby, Weir, Sr.
RB – Ethan Payne, Poca, So. OL – Zach Frazier, Fairmont Senior, Jr.
OL – Robert Arnold, Robert C. Byrd, Sr.
OL – Jacob Huff, Winfield, Sr.
OL – Mason Walker, Bluefield, Sr.
OL – Will Dean, Nitro, Sr.
K – Kaulin Parris, Bluefield, Jr.
UTIL – Jacob Hartman, Petersburg, Sr.
UTIL – Will Hackney, Sissonville, Sr.
DL – Sean Martin, Bluefield, So. DL – Austin Sponaugle, Bridgeport, Sr.
DL – Terymykal Alexander, Shady Spring, Sr.
DL – Tyler Komorowski, Weir, Sr.
LB – Daniel Romans, Elkins, Sr.
LB – Hunter Moore, Lincoln, Sr.
LB – Mike Bartram, Wayne, Sr.
LB – Arnold Martin, Bluefield, Sr.
LB – Jared Sagraves, Nicholas County, Sr.
DB – Bronson Skeens, Poca, Sr.
DB – Elijah Posey, Fairmont Senior, Sr.
UTIL – Sebastian Spencer, Weir, Sr.
UTIL – Rhett Heston, Fairmont Senior, Sr.
P/UTIL – Cason Payne, Point Pleasant, Sr.
QB – Daylin Goad, Mingo Central, So. WR – Jake Pitman, Fairmont Senior, Sr.
WR – Mayson Miller, Sissonville, Sr.
WR – Luke LeRose, Nicholas County, Jr.
RB – J.J. Davis, Bluefield, Jr.
RB – Desmond Fluharty, North Marion, Sr.
OL – Deiyantei Powell-Woods, Bluefield, Sr.
OL – Magnus Sheets, Fairmont Senior, Sr.
OL – Trevon Franklin, Point Pleasant, Sr.
OL – Nathan Pettus, Bluefield, Sr.
OL – Johnny Adkins, Wayne, Sr.
K – Jared Griffith, Lewis County, Jr.
UTIL – Khori Bass, Oak Hill, Sr.
UTIL – Zach Taylor, Oak Glen, Jr.
DL – Jaden Marino, Robert C. Byrd, Sr.
DL – Colton Groves, Nicholas County, Jr.
LB – Ben Kee, Herbert Hoover, Jr.
LB – Seth Whitt, Chapmanville, Sr.
LB – Jacob O’Dell, Nicholas County, Sr.
LB – Trey Pancake, Bridgeport, Jr.
DB – Freddie Dawson, River View, Jr.
DB – Monroe Mohler, James Monroe, Jr.
DB – Reggie Redman, Keyser, Sr.
DB – Josh Wamsley, Point Pleasant, Sr.
UTIL – Chucky Felder, Logan, Sr.
UTIL – Owen McClanahan, Poca, Jr.
UTIL – Dalton Pollock, Frankfort, Sr.
P/UTIL – Reed Reitter, Weir, Sr.